Derry City manager Kenny Shiels was proud of his players despite semi-final defeat to Limerick. ALTHOUGH disappointed to exit the EA Sports Cup at the semi-final stage, Derry City boss, Kenny Shiels, insists he is ‘proud’ of the way his players fought until the final whistle in a desperate attempt to keep their final hopes alive. 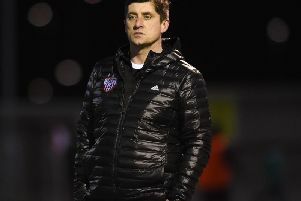 Shiels was full of praise for his young players, including Josh Daniels and substitutes, Nathan Boyle and Conor McDermott, who he believes will learn valuable lessons from the defeat to the First Division’s champions-elect. Derry City boss, Kenny Shiels felt there was a push on defender, Dean Jarvis in the lead up to Limerick's winning goal in the EA Sports Cup semi final at Brandywell. The Candystripes went into the semi-final at Brandywell on Monday night as overwhelming favourites given their high flying position in the Premier Division. And the Derry manager expects his young talent to become better players after experiencing the heartache of semi-final defeat as Stephen Kenny’s first half strike proved the difference on the night. “I thought the performance was very good,” said Shiels. “We dominated a game against a team that has won practically every game this season. But our boys were brilliant. They played good football with plenty of emphasis on attack and adventure and I was really pleased with them. They fought until the very end in an attempt to get something but it just didn’t happen for us. They’re playing in a team who are favourites to go through in the semi-finals in front of their home crowd. The tension that brings and the challenge and the pressure - that experience will stand by them. Shiels felt Limerick lived a charmed life at times given Derry’s dominance, however, the Candystripes simply weren’t clinical or decisive enough in the final third. “Limerick came here and they were charmed at times. We had 24 attempts on goal and 74 per cent possession. All of those stats are out there but you have to put the ball in the back of the net and that didn’t happen for us. And the Derry boss felt there was a push on City defender, Dean Jarvis before Stephen Kenny found the back of the net in the first half. “There was a push on Dean Jarvis at the back post and people were shocked the referee gave the goal.